Every Monday I post a photo that is meant to inspire you, motivate you, cause you to pause and ponder, remind you of your dreams and hopefully entice you to act on whatever your goals may be. This Monday, May 21st we visit Borobudur, the 9th-century Buddhist monument located in Magelang Central Java Indonesia. 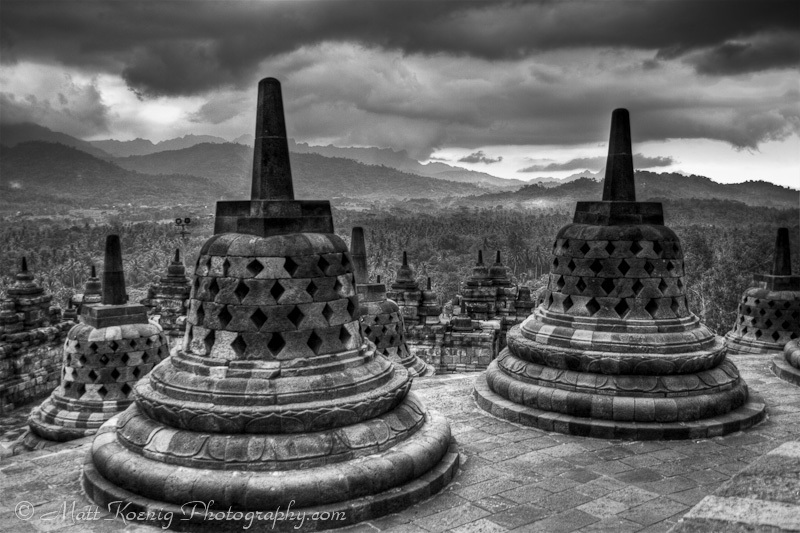 Borobudur is a 9th century Buddhist monument and a World Heritage Site. Canon 20D | ISO 200 | 21mm | f/3.5 | 1/30th sec. I visited Borobudur back in 2005 which is when I took this photo. It is an incredible place that is a must see if you are ever in that area of Indonesia. I plan to go back and do a sunrise tour. This photo is an pseudo-HDR image created from a single exposure. I used the methodology outlined in this article on How to Create a Pseudo-HDR Photograph. Here are a few quick facts about Borobudur. Borobudur contains approximately 2,670 individual bas-reliefs – 1,460 narrative and 1,212 decorative panels. The sculptured bas-reliefs extend over a total length of 6 km. There are 504 original Buddha statues. Borobudur was built between AD 750 and 842 which was 300 years before Angkor Wat. Over 60,000 m3 of stone was used in it’s construction. Have a great Monday wherever you may be and whatever you might be doing. Hey Jamie! Thanks for writing such a comprehensive “how to” on pseudo HDR. I’ve only recently discovered your site and have been enjoying your adventures and photography. Thanks for the inspiration. Funny I was just having a conversation about how I don’t like HDR but I really do like this photo – perhaps I only like faux HDR? I will agree that HDR is often overdone although there are times when I like that surreal look like some of the stuff Trey Ratcliff does. But I tend to like it more when you can’t tell that HDR was used. There are plenty of scenes that the camera sensor can’t fully capture and that’s where tools like HDR come into play to create the image the way I remember actually seeing it. I’m glad you liked this one. I’ve really been enjoying your Hawaiian posts.